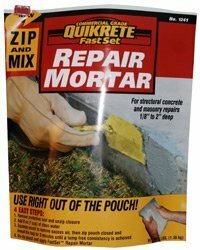 QUIKRETE® Zip & Mix Repair Mortar is a multi-purpose repair mortar uniquely packaged to allow the product to be mixed in its pouch, eliminating the need for a pail. The fast-setting, polymer modified repair mortar is specifically formulated to make structural repairs to any concrete, masonry or stucco surface. To mix, unzip the enclosure and break through the protective seal. Then, add 10 ounces (or 1¼ cups) of water to the mortar, remove excess air from the package and knead thoroughly. Once mixed, unzip the pouch and apply the repair material with the included application tool. QUIKRETE® Zip & Mix Repair Mortar does not require any bonding adhesive and can be applied to structurally sound concrete that has been dampened. The mortar’s unique properties allow the material to be sculpted during application. With 20 minutes of working time, the repair mortar is ideal for vertical or horizontal repairs ranging from feather edge to two inches deep, including concrete cracks, curbs, sewers, retaining walls, decorative moldings, bridge columns and other industrial applications. QUIKRETE® Zip & Mix Repair Mortar will achieve 4,500 psi. For more about this and other products visit www.quikrete.com. Does this product come in colors other than gray? Will this product work on cracked mortar joints in a brick wall of a house exterior? I have cracks in the stucco on the exterior of my house. How can I repair them?